A classic lava lamp contains a standard incandescent or halogen lamp which heats a tall (often tapered) glass bottle. A formula from 1968 US patent consisted of water and a transparent, translucent, or opaque mix of mineral oil, paraffin wax, and carbon tetrachloride.p. 2, line 30 The clear water or mineral oil can optionally be coloured with transparent dyes. Common wax has a density much lower than that of water, and would float on top under any temperature. However, carbon tetrachloride is heavier than water (also nonflammable and miscible with wax) and is added to the wax to make its density at room temperature slightly higher than that of the water. When heated, the wax mixture becomes less dense than the water, because the wax expands more than water when both are heated.p. 1, lines 40 & 45 It also becomes fluid, and blobs of wax ascend to the top of the device where they cool (which increases their density relative to that of the water) and then they descend.p. 1, line 47 A metallic wire coil in the base of the bottle acts as a surface tension breaker to recombine the cooled blobs of wax after they descend. However, lava lamps made in China for the US market since 1970 do not use carbon tetrachloride, because its use was banned that year due to toxicity. The manufacturer (Haggerty) stated that their current formulation is a trade secret. The bulb is normally 25 to 40 watts. Generally, it will take 45–60 minutes for the wax to warm up enough to form freely rising blobs, when operating the lamp at standard room temperature. It may take as long as 2 to 3 hours if the room is below standard room temperature. Once the wax is molten, the lamp should not be shaken or knocked over or the two fluids may emulsify, and the fluid surrounding the wax blobs will remain cloudy rather than clear. Some recombination will occur as part of the normal cycle of the wax in the container, but the only means to recombine all of the wax is to turn off the lamp and wait a few hours. The wax will settle back down at the bottom, forming one blob once again. Severe cases can require many heat-cool cycles to clear. In 2015, a new design was introduced into the market that uses ferrofluid in place of wax. British entrepreneur Edward Craven-Walker had the idea for the lava lamp in 1963 after watching a homemade egg timer, which was made from a cocktail shaker filled with liquids, as it was bubbling on a stove top in a pub. He hired British inventor David George Smith to develop the device and the chemical formula required put his idea into practice. Smith is credited as the inventor on the original U.S. Patent 3,387,396 for a "Display Device", that was filed and assigned to Craven-Walker's company in 1965, and subsequently issued in 1968. Craven-Walker's company was named Crestworth and was based in Poole, Dorset, in the United Kingdom. Craven-Walker named the lamp "Astro" and had variations such as the "Astro Mini" and the "Astro Coach" lantern. In 1965, two men named Adolph Wertheimer and Hy Spector were intrigued by Walker’s product when they saw it at a German trade show. 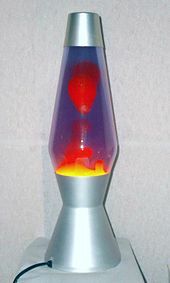 They bought the American rights and began the Lava Manufacturing Corporation in Chicago, Illinois to sell what they called the Lava Lite Lamp. In the late 1970s, the US rights were sold to Larry Haggerty, who created a subsidiary of his company, Haggerty Enterprises, called Lava World International, which produced American lava lamps for over 30 years. Craven-Walker retained the rights for the rest of the world, and took on two business partners in the late 1980s named Cressida Granger and David Mulley. Eventually Granger and Mulley took over the company and they changed the name to Mathmos in 1992. Edward Craven-Walker remained a consultant until his death in 2000. Mathmos continues to make Lava Lamps and related products. Mathmos won two Queens Awards for Export, as well as Best Multi-Media prize at the Design Week awards. Astro lava lamp was launched in 1963 and celebrated its 50th anniversary in 2013. Mathmos lava lamps are still made in the original factory in Poole, Dorset. ^ Carmen Drahl. "Lava Lamps - A density lesson inspired the Woodstock generation". Chemical & Engineering News. ^ Starr, Michelle. "Ferrofluid Makes the Lava Lamp Cool Again". cnet.com. Retrieved 2015-11-23. ^ Abigail Tucker (March 2013). "The History of the Lava Lamp: At 50, the legendary relic of the college dorm room is still groovy after all these years". Smithsonian magazine. Retrieved February 28, 2013. ^ "Vintage Lava Lamps | Collectors Weekly". collectorsweekly.com. ^ "History of Mathmos and the original lava lamp". www.mathmos.com. ^ "Lava lamps: Still bubbling at 50". 29 August 2013 – via www.bbc.co.uk. ^ Capital, Talon Merchant. "Talon Merchant Capital Acquires Lava World International Makers of the 'Lava Lamp'". www.prnewswire.com. Retrieved 2017-11-13. Wikimedia Commons has media related to Lava lamps. Basics of lava-lamp convection, by Balázs Gyüre and Imre M. Jánosi, Phys. Rev. E, 80, 046307 (2009). This page was last edited on 3 April 2019, at 09:41 (UTC).